Use these free, downloadable e-book versions of Microsoft Office help articles as a training book that won’t close while your fingers are on the keyboard. They’re easy to carry along so you can brush up on your skills for a few minutes while you’re waiting in line. This small collection is a trial to see if you like the e-book format. Use the voting buttons at the bottom of this article to let us know if you think they’re useful. And, let us know what else you’d like to see made available in this format. These e-books are in .EPUB format, which is a standard e-book format that can be read by many devices and applications. These e-books are in .MOBI format, which can be read by apps and devices including the Amazon Kindle. How do I get the e-book on my device? There are too many devices and applications to cover here, so be sure to check the documentation for your e-reader. Here are instructions for some popular e-readers. On your Kindle, open the Web Browser. 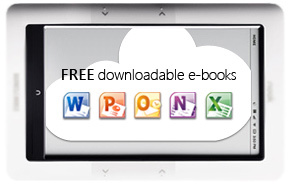 Use the 5-way controller to move the cursor to the link for the MOBI-format e-book you want. Press the center button in the 5-way controller. Download the MOBI-format version of the e-books to your computer. Connect your Kindle to the computer using a USB cable. The Kindle shows up as a USB drive on your computer. On your computer, open the Kindle drive and then open the Documents folder in the Kindle. Drag the e-book files you downloaded into the Documents folder. Eject your Kindle and disconnect it from the computer. Check whether your e-reader app reads EPUB or MOBI format e-books. Download the e-books in the appropriate format to your computer. Under Devices, select your iPhone. At the top of the window, click the Apps tab. Scroll down to File Sharing, and drag the e-books into the window for your e-reader app. How do I read e-books on my computer? If you want to read e-books on your computer, you’ll need to install an e-book reader program. However, all the information in the e-books is also available on the web at Office.com – see the links to the articles lower on this page. Here are some popular e-book reader programs. There are many more programs available; this is just a small sample. The articles that the e-books are based on are on the web – if you want to read on your computer and you have an internet connection, no e-book reader software is required.